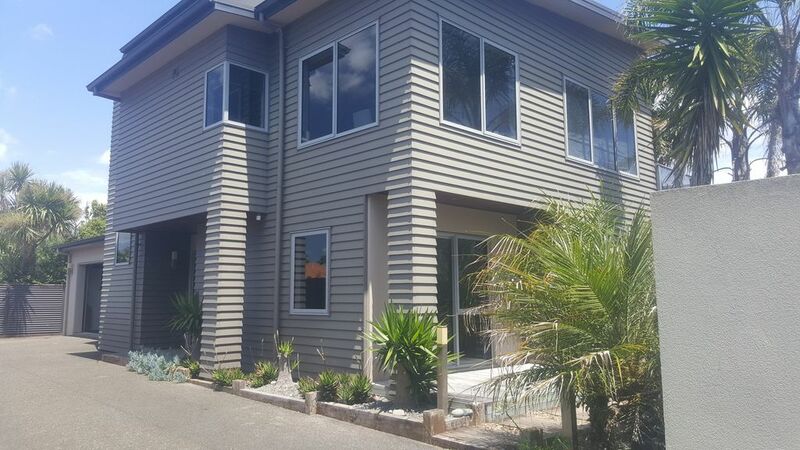 This home at beautiful Papamoa Beach provides everything you need for a fantastic beach holiday. Three storied spacious, open plan living with a separate cinema room with Sky sport and Movies. The entertainers kitchen is fully equiped with modern appliances and flows easily through an open living room out onto an open deck. Stunning bathroom on ground floor with shower, toilet and spa bath. Bath Towels not to be taken to the Beach. Place is to be left as found. Extras: Linen (included); Free use of Kayaks (included); NOTE: Under Kiwi bach tradition you are expected to: Tidy the house and do the dishes before you leave. Free wifi and Sky TV. Very clean and very good. Everything is very good. But having to go to a rubbish collection place that 9km away and pay $14.50 for rubbish seems very inconvenient. All guests remove their own rubbish and either take it home or drop it off at the rubbish and recycling centre....which happens to be free in the correct rubbish bag, which we provide. I don't know why you paid. This property was amazing! Was perfect for a girls weekend. Close walk to the beach, very spacious, loved the radio speakers :) Would love to have stayed longer and would highly recommend anyone else to stay here. Thank you! Perfect guests, welcome again. One of the very few to leave the property as found. Thankyou. Awesome place to stay with a group of people. We had 4 couples here and there was plenty of room. 2 living spaces 2 outdoor areas to sit and enjoy the summer weather. Close to the beach and 15 minute walk to the shops. Lovely guests to have had in our home, clean, tidy and respectful. Fabulous home well setup for large family group. Loved our stay. Lovely home, clean and well set up for large family group. Easy to follow instructions, handy to beach and amenities. Would definitely stay again. House left as found, clean and tidy....thankyou for being lovely, respectful guests! Amazing property!! Catered to all our needs. Great for a large family and awesome location. Would definitely recommend. Wonderful break way in a beautiful home with all amenities. Beautiful spot, close to beach. Lovely spotless home with everything a family group needs. Good, speedy communication with owner when required. Very easy and relaxed stay despite a big family. Fabulous. You were wonderful guests to have in our home. The house was left very clean and tidy, most impressive. Thank you.